If you are lucky enough to be blessed with a wonderful woman who brings you paradise every time you look into her eyes, then you definitely need to let her know how precious she is to you. 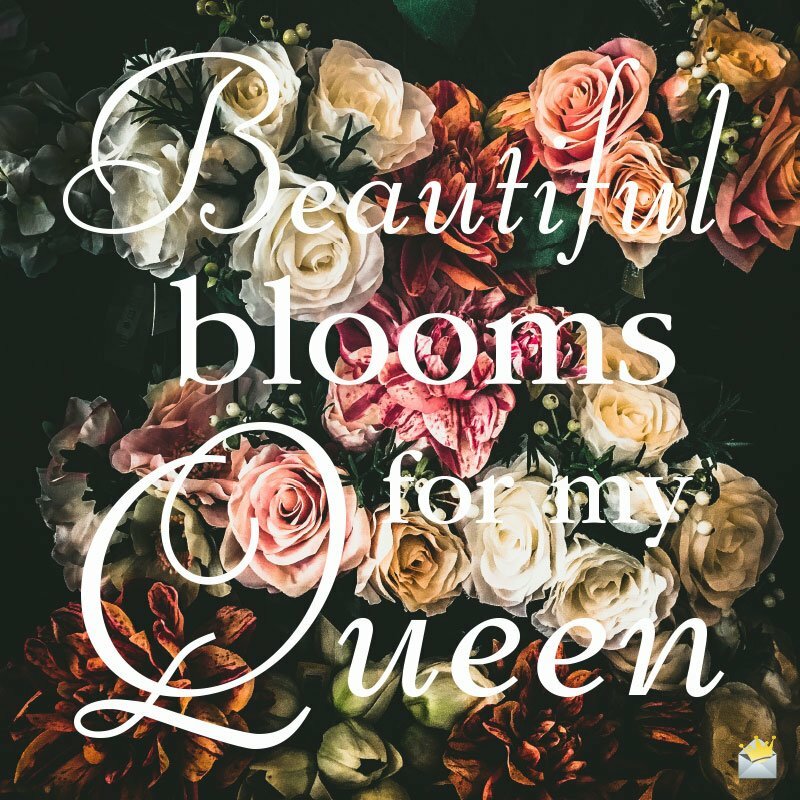 Here are some very powerful romantic quotes whose themes center around love and devotion that you can use to melt your queen’s heart and let her know you’ll love and treasure her until the end of time. What are you waiting for? 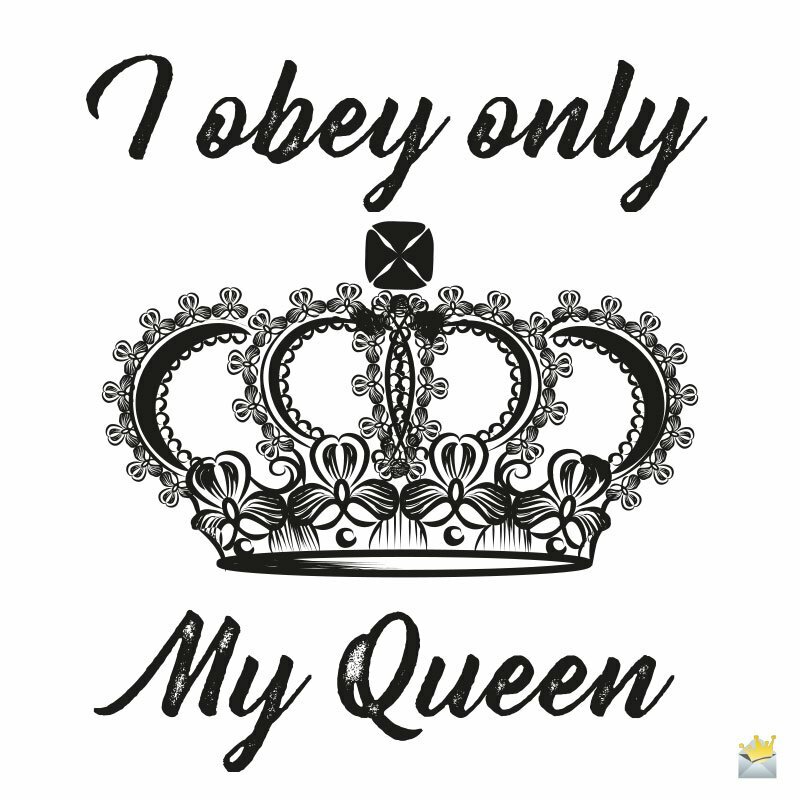 Make her feel like the queen that she truly is! My queen, there’s nothing in this universe that grows faster than my love for you. Every single second, it grows a hundredfold. If someone were to ask me why I will never stop loving and treasuring you, I could spend an eternity giving them reasons and still not exhaust all the amazing reasons why I love you and why you shall forever reign as the one and only queen of my world. You are my queen, my best friend, the love of my life, my world. You are in fact everything that puts a smile on my face. And that is why nothing and no one shall ever take your place. I love you more than I can ever say in any language spoken by man. I will forever owe my life to you, my queen, for you alone bring me the happiness that sustains my life. I love you from the deepest chamber of my heart. My dearest queen, you are my paradise. Every day that I’m lucky enough to spend in your company is the most beautiful day of my life. Thank you for being the queen of my heart and world. My love for you will never die, Your Royal Highness. My queen, because you rule my heart, I feel like the luckiest man alive. I promise to always love you, honor you, protect you and never let you down for as long as my heart continues to beat. I love you so much. My queen, loving, treasuring, and honoring you are part of my DNA. Thank you so much for bestowing upon me the greatest and most priceless gift in the universe – true happiness. For me, every day is Christmas in paradise because I have you in my life. Thank you for being my dream come true and queen. In my eyes, God can never ever create anybody more wonderful and more beautiful than you. My queen, I hope now you understand why I love and cherish you more than life itself? The fact that you are my queen is more valuable to me than an amalgamation of all the gold, diamond and money of the world. I will love, honor and respect you until end of the existence of time. Queen of my heart, my love for you is like Father Time – it never ends. How I got so lucky to have someone as phenomenal as you to be my queen is something I will never understand! You could have ruled anywhere but you chose my world. For that, I owe you a huge debt of gratitude. I love you more than any living or nonliving thing under the sun. Words can’t describe how wonderful I feel whenever I’m blessed enough to be with you, especially when I hold you in my arms and feel the warmth of your body against mine. My queen, I love you like I’ve never loved any woman on this planet. What’s true paradise? It is simply being with you, the queen of my life. My queen, to say I will love you until the day I breathe my final breath on earth would be the understatement of the century! I will love you until both God and time die. How good the heavens have been to me for bringing the most beautiful queen on earth into my life. Forever shall you reign as the one and only queen of my heart. And forever shall I love you and be your loyal subject, my precious queen. 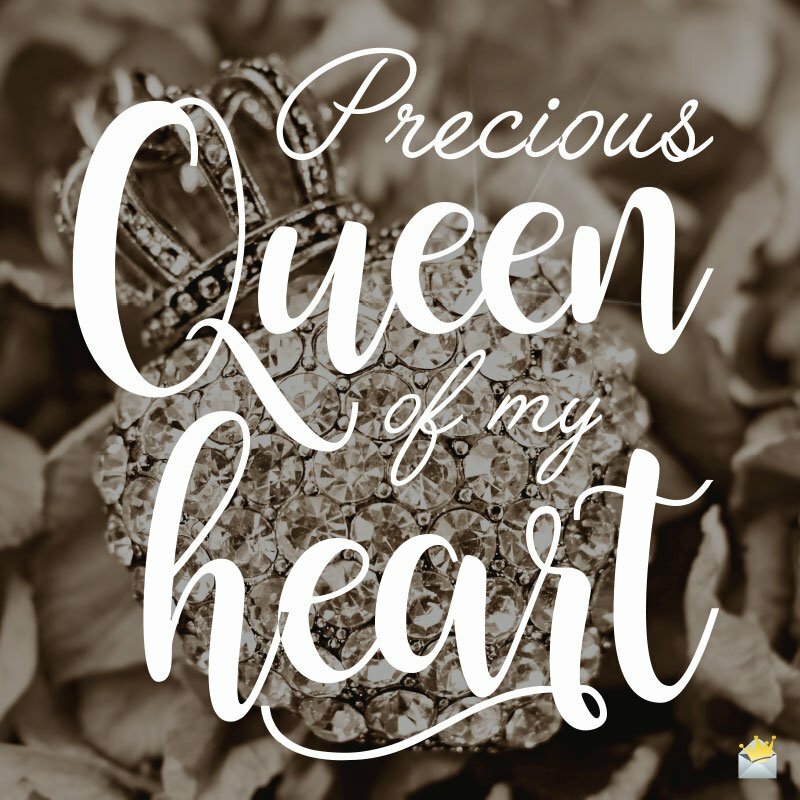 You are my queen for life – there’s no two ways about that. Wherever I am with you is my only definition of being in paradise. My Queen, all I want to do is shower you with tons of love, kisses and warm hugs. I will follow you and be there for you wherever you go because my love for you multiplies a 1,000,000,000 times by the minute. You made my all dreams come true the moment you decided to rule as queen in my world. I will forever love and take good care of you, sweetheart, because you are my world. You, my beautiful queen, will always be the only one to bring me true happiness and make my life complete. I will never ever take your love for granted or ever by unfaithful to you because you are my paradise. Sweetheart, you are and will forever be the love of my life, the queen of my heart, my soul mate and my closest friend in this world. The joy of your love is all I need to make my life whole. You are not only my queen but also my world and the air that I breathe. No man in this world is as lucky as me, unless his life is blessed with an amazing queen like you. My queen, loving you is what I was put on this earth to do. And I promise to do it from the bottom of my heart and with all my might until the moment my heart stops beating. Thank you for being my sweet companion for life. The first time my eyes saw you, I became so mesmerized I forgot my name. That’s the power of the beauty you possess, my love. I will forever thank my lucky stars for crowning you as the forever queen of my heart. I love you. You are the queen of my existence and the most treasured person in my life because you bring me paradise. To me, heaven will not be heaven if I get there and don’t see you. My dearest, you are the best thing in my life – today and forever. I will love you and be loyal and faithful to you until the day the rivers stop flowing into the sea. This isn’t a promise – it is a fact!